Home Blog Breed Info Are Pugs Hypoallergenic? 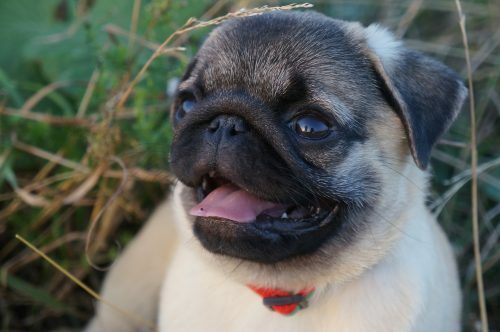 Before choosing a Pug, hypoallergenic status is a consideration you must make in order to gauge whether or not this is the right breed for you. Unfortunately, though Pugs are small in stature, they are not among the dog breeds listed by the American Kennel Club as being hypoallergenic. Below is a guide to how to hypoallergenic status is determined, other dog breeds that are hypoallergenic, and measures you can take to minimize the allergic impact of a Pug if you determine that it is the right breed for you. Many people suffer from allergies, but also possess a devout love of dogs and a desire to have a dog become a part of their family. This makes hypoallergenic dog breeds a vital category of furry friends. According to the American College of Allergy, Asthma, and Immunology, as much as ten percent of the United States population is allergic to dogs. It is important to keep in mind that no dog is one hundred percent hypoallergenic, but there are a handful of breeds that have been shown to cohabitate well with allergy sufferers. Dogs that are considered hypoallergenic possess a coat that is predictable and non-shedding, which produces less dander. Dander is attached to pet hair and is the root cause of most allergies to dogs in human beings. Dander is dried skin that flakes off (think of it as the equivalent of human dandruff). In addition to allergy-causing dander, some people also possess an allergy to proteins found in dog saliva and skin. This is why some people may experience an adverse reaction to a lick or a scratch from a dog. Though rarer, some people are also allergic to dog urine. With this information in mind, you can explore the list of most popular hypoallergenic dog breeds. If you have determined a Pug to be the right breed for you despite your allergies, there are steps you can take to mitigate the impact and frequency of allergic reactions to your Pug. Below is a list of helpful tips and tricks to keep you living comfortably with your Pug. One of the most important steps you can take lessen the outbreak of allergies in response to your Pug is to implement a vigilant grooming routine. Since the majority of pet allergies are caused by dander, it is important to try to cut down on the amount of dander being released by your Pug. Brush your Pug at least once a week to reduce the amount of hair in your home. It is best to brush your Pug outside of your home so that any excess hair that is released does not cling to the furniture or floor. For bathing, it is recommended that Pugs are bathed at least every three months and it is best to use hypoallergenic shampoos and soaps to reduce the potential for a reaction. It is also vital to clean the skin folds on your Pug’s face as these can hold bacteria, dander, and dirt. To clean these folds, use a dampened cotton ball or cotton swab to thoroughly remove all bacteria and dirt between the folds. Once you have wiped them down, it is then recommended that the folds be dried with a clean cotton ball to prevent moisture build-up between the folds. The final step to reduce allergic reactions when living with a Pug is to keep your home and your Pug’s toys and bedding clean. This includes cleaning, sweeping, and mopping floors, wiping down counters, dusting, and laundering all bedding weekly in hot water. By taking the above steps, you can significantly reduce your exposure to allergens and foster a comfortable living environment with your Pug.